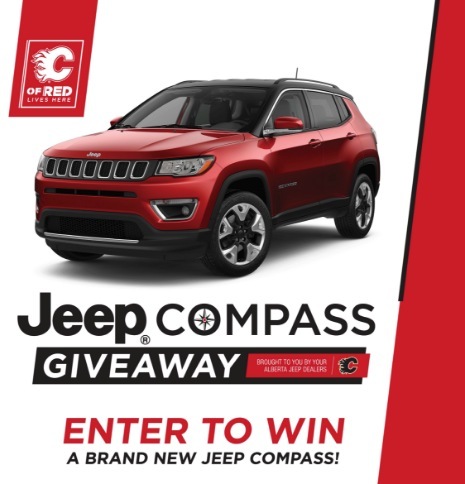 Enter the Calgary Flames Jeep Compass Contest, in it, you get the chance to Win a brand new Jeep Compass. Entry to this contest is only open to legal residents of Alberta who are 18 years of age or older at the time of entry. To enter you simply need to visit the official contest web page and complete the online entry form with the required information including name, last name, email address, phone number, and your Sportsnet Password, if you have one. This contest closes at 11:59 pm MT on February 7, 2019. Winners will be selected on a game to be held on the Calgary Flames vs Ottawa Senators game. There is one Grand Prize available to be won, consisting of a 2019 Jeep Compass valued at $42,125. There are also three runner-up prizes, each consists of a $2,000 Calgary CO-OP gift card. The Calgary Flames Jeep Compass Contest begins at 12:01 AM. Mountain Time (“MT”) on the morning of Thursday, February 7, 2019 and ends at 11:59 p.m. Mountain Time (“MT”). The Grand Prize winner will be announced during half-time at the March 21, 2019 Calgary Flames vs Ottawa Senators.